Thousands of Honduran migrants heading to the United States -- a caravan President Donald Trump has called an "assault on our country" -- stopped to rest Tuesday after walking for two days into Mexican territory. Sleeping on cardboard boxes or plastic bags, the migrants set up a massive, impromptu camp in the southern town of Huixtla, 70 kilometers (45 miles) from the Mexico-Guatemala border. Many nursed bleeding feet mangled by 10 days of walking nearly 800 kilometers in plastic shoes or flip-flops. "They're exhausted," said migrant rights activist Rodrigo Abeja, of the group Pueblos Sin Fronteras (People Without Borders), which is accompanying the caravan. "They're going to rest here today and tonight," and then continue their journey north, he told AFP. More than 7,000 people have now joined the caravan, according to the United Nations, including some Central Americans who were already in Mexico. 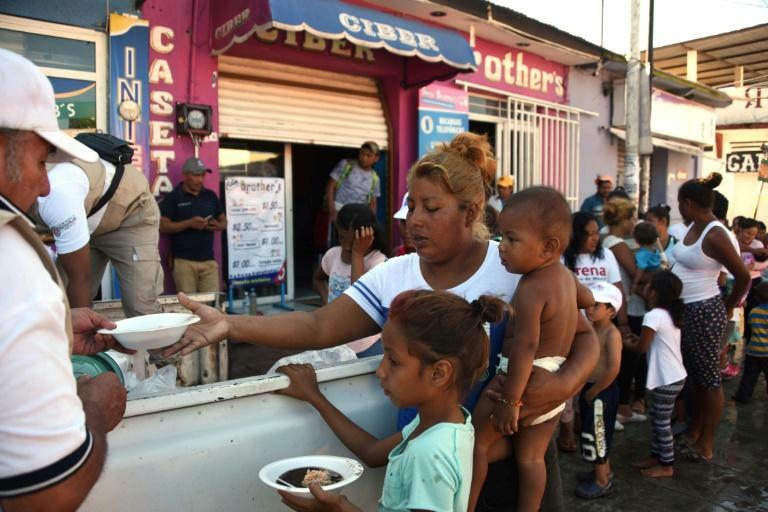 The caravan has become a politically loaded issue, with only two weeks to go before the United States votes in key midterm elections. Trump has taken to attacking it regularly -- both on Twitter and on the campaign trail -- firing up his conservative base with the anti-immigration rhetoric that helped get him elected in 2016. On Monday, he said the US would start cutting aid to Honduras, Guatemala and El Salvador for failing to stop the migrants, called the caravan a national emergency and alleged it was infiltrated by "Middle Easterners" and members of the ultra-violent gang MS-13. Adding to the political tempest, Vice President Mike Pence said Tuesday that according to Honduran President Juan Orlando Hernandez, the caravan "was organized by leftist groups in Honduras financed by Venezuela and sent north to challenge our sovereignty." US Customs and Border Protection meanwhile said it had apprehended a record 16,658 people who arrived in the country illegally in families last month, up 900 from August and nearly 12,000 from September 2017. A senior administration official called the surge a "crisis." Mexico vowed not to bow to outside pressure to halt the caravan. But activists accused the country of violating the migrants' rights by detaining anyone who tried to apply for asylum. Mexican authorities said they had registered 1,699 asylum applications from caravan travelers who opted to enter the country legally. Another 495 migrants have voluntarily asked to be returned to Honduras, they said. 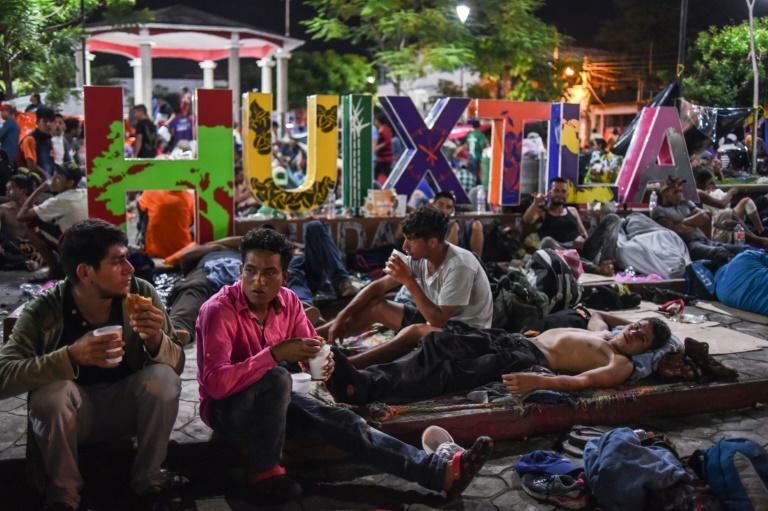 Late Monday, Mexico allowed about 400 migrants to enter the country after they spent days packed onto a bridge over the Suchiate River, which forms Mexico's southern border with Guatemala. The caravan had stormed through a series of border barriers Friday and flooded onto the bridge, but hundreds of Mexican riot police blocked their passage. Most of the migrants then swam or took rafts across the river, but one group had remained camped out on the bridge. Another group of about 1,000 Hondurans meanwhile started a separate march Sunday across Guatemala, headed for Mexico and then the United States. 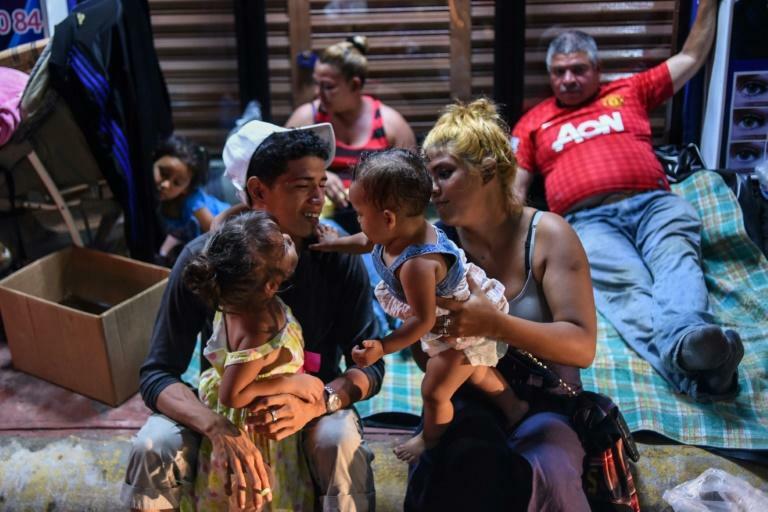 Migrants in the main caravan -- which set out on October 13 from San Pedro Sula, Honduras -- have been traveling on foot or hitching rides on passing cars and trucks, often crowding onto them precariously. Two migrants have been killed when they fell off vehicles that let them hitch a ride, according to authorities in Mexico and Guatemala. Humanitarian organizations estimate that one-fourth of the caravan's members are children, a representative of Save the Children told AFP. Guadalupe Del Carmen, 29, who is traveling with her nine-year-old son, recounted the difficulty of the journey -- such as the moment her son started to cry, "Mommy, I don't want to do this anymore" while crossing the Suchiate River on a raft made of inner tubes. "He wanted to go back to Honduras. But I explained we can't go back, that the situation in our country is too difficult and that's why we had to run away," she said quietly. With a homicide rate of 43 per 100,000 citizens, Honduras is one of the most violent countries in the world.